Eating with a spork every day is a bit strange. Whenever I brought my lunch to work before the project, I always grabbed metal utensils from the drawer and threw them into my lunch bag. I did it because I didn’t want waste plastic. Not to mention that eating from metal is just nicer than eating from plastic. I did some light research (wikipedia) about sporks and I was shocked to find out that they have been around for more than 100 years. I had assumed that sporks were recent thing. 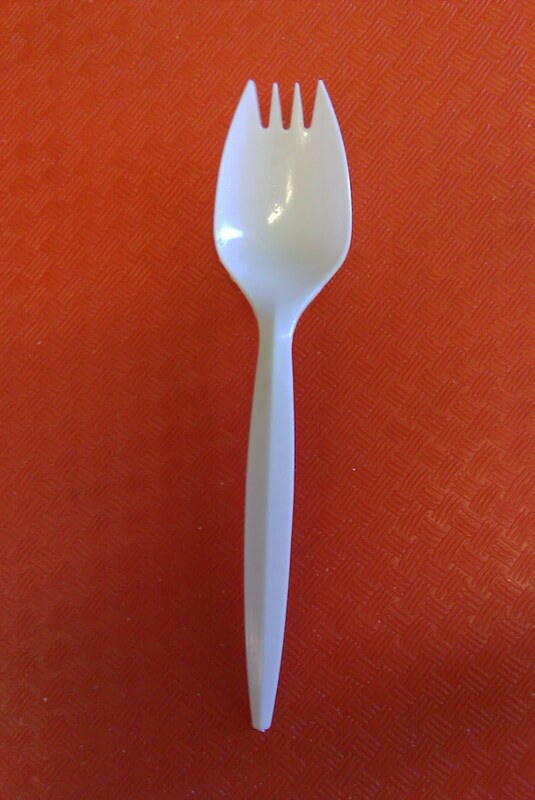 I’m sure the reason that sporks were adopted as the one and only cafeteria utensil is for the convenience of plastic. But I think we need to bring back real utensils and dishwashers. I read a school can recoup the cost of a dishwasher within three years (I can’t find the citation though). And what about the cost of garbage pickup and dumping? We have to think about long-term environmental effects of thousands upon thousands of single use plastic sporks going into our landfills. Seven billion meals are served in school every year (Free for All). That’s a lot of plastic and styrofoam! We have to reimagine school lunch. That means ditching the spork and offering every student a real spoon and fork with their meal (knives are out for the obvious reasons). Real silverware is the right choice for them and our environment. Maybe I’ll stop grabbing the spork from the cafeteria and bring my own silverware from home. Or I could buy myself a titanium spork, but I’m not quite that dorky. We asked to move to trays & silverware in our elementary school to no avail. The "kitchen" isn't really a kitchen but rather a staging area where they take food that has been cooked and warmed elsewhere in the district before it's transported to our school and placed on stryofoam trays. The costs involved with installing a system to wash real trays and utensils is supposedly cost prohibitive because additional wiring and plumbing would be required. Not really sure how we devolved to this point but with our state's current budget crisis no new expenditures are likely any time soon. My husband and son both own titanium sporks. We love them, both for lunch and for camping. And I agree with the post about knives. My three and a half year old knows how to use a knife properly; seems to me that if we teach our children how to use utensils and then trust them with said utensils, they'd use them for good, not evil. I find it really disturbing that so many of the comments here think we need to treat our school children like prisoners. Why on earth shouldn't they have real forks, knives and spoons? Doesn't the fear of dinner knives as weapons say something horrible about our perceptions of schools? I refuse to believe that students are "safer" from each other with plastic sporks than with real metal forks. @Anonymous 8:36 – I'm sorry you have such low expectations for your students. Perhaps with additional supervision, conflict resolution lessons, more physical activity before lunch, and knowing in no uncertain terms what kind of behavior is expected of them, your students might just surprise you. If you don't think your student population can be trusted with metal forks, the solution should be to address the underlying issues, not to issue them sporks. How about a rule that anyone who misuses metal utensils has to help the lunch staff/janitors clean the cafeteria and wash the utensils after school? By hand. And with the loss/shrinkage issue, I agree that additional supervision and reminders could work. As to the water/detergent/labor costs go, that might take some number crunching. The cheapest option isn't always the best option. How about compostable plates/trays and metal utensils? Compostable trays are a waste of money if you don't compost. You know that the schools' waste is going to a landfill and will be "well preserved". I'm so happy that this word is finally getting out. I'm actually watching "Jamie Oliver's Food Revolution" on ABC right now. Your school could also get rid of all of the containers the food is served in. When I was in high school, you grabbed a tray and silverware, and the lunch ladies put the food on your tray (if there was something extra set out, you could grab it). It's a good point but a metal fork can still be used as a weapon so that's probably why they opt for the spork instead. I prefer to call them foons. And yeah, you can do just as much damage with a metal fork as you can with a butter knife. But come on. We're talking about primary schools here, not prison. Do we really need to worry that much about students using utensils as weapons? I'm sure in some areas it's a real concern, but surely most schools don't have that big of a problem with students getting into fights and using forks as weapons. You know, pens and pencils are mighty pointy. Just saying. You can't keep kids away from every potential weapon there is. Here in Central Florida a couple years ago there was a girl who was suspended and barred from her HS graduation because she had a butter knife on the back floorboard of her locked car which was parked in the student parking lot. She had moved the previous weekend and it had fallen out of one of the boxes. The school said she had to be punished under the zero tolerance policy because the knife was a weapon! She was an honor roll student who had never been in trouble at any point in her school career. biodegradable instead of compost-able! These products tend break down-with no additives or special measures taken- in less than 1 year. these products could be used to compost onsite in some type of fabulous school garden or simply thrown in with the trash and let to decompose on their merry way. Anonymous said biodegradable. That is correct. Sea World in Orlando uses silverware made from corn. I think it is worth it. Sporks remind me of elementary school dining. Real silverware is obviously the most sustainable option, but as a restaurant owner I can tell you it's more than just the dishwasher: silverware disappears. It doesn't matter how ugly it is; people will steal it. Grown adults will steal silverware from restaurants. Kids could bring their own silverware from home; but it's not likely they'll remember on a daily basis. Schools could recommend that kids bring their own silverware, and stop automatically including sporks or other plastic ware in lunches, only offering them on request or at an additional fee to encourage kids to bring their own. I went to a school that had a contraption that fit on the top of the trash can with a powerful magnet. Any forks and spoons that were accidently thrown away got stuck before they went in. Does anyone realize that some schools don't even have dishwashers. They have to clean all of the dishes in 3 compartment sinks….it costs more money to clean real siverware then to buy the plastic stuff (labor,chemicals for the dishmachine, repairs, ect.). Parents are not willing to pay more for there childs lunch just so they can use a real fork and spoon!! I have two titanium sporks; I got them for my computer programmer boyfriend for Christmas last year. My only gripe about them is that they taste metallic, even after several washes. You can buy metal sporks these days. Kinod of neat. Also whats wrong with sporks they are the best. You can eat soup and your pasta with the same utensil. I work with at risk kids. I'm trained in safe crisis management, because our kiddos, at times, have difficulty controlling thier actions. I eat dinner (my lunch) with my kiddos everyday, and I eat what they eat. Our dinners look a lot like your lunches, except that we don't use the pre-packaged portions. Our kids eat on trays, and use real utensils, including butter knives. It's important that our residents have as family-like a meal as possible. Butter knives have not been a problem. Honestly, it would be easier to cause an injury with a fork. I imagine the landfills of our country are feeling the load of so much trash unneccessarily generated from school programs and institutions such as the one I work for. We generate enough trash as it is, and we don't use plastic utensils and containers. I run a cafeteria, we use hard plastic (reusable) trays and plastic silverware. No way we are going to real silverware. We started last year will 700 trays. We are down to 150 now becuase TEACHERS don't return them and kids throw them away becuase they think it is "gross" to dump their trays and then take them to the dish window. At some point all the schools in my town had dishwashers. What happened to them? We used heavy plastic bowls and plates, trays, real stainless steel knives, forks, and spoons. Now with Zero Tolerance policy a knife of any kind will get you in big trouble. I'd love to see an experiment done with the compostable sporks or spoons to see if they really would decompose in a timely manner. I teach 3 yr olds. Everyone brings their lunch. Only one child has a hot lunch everyday, he handles his spoon and fork very well. His lunch may be a hot lunch but it isn't that great, prepackaged. Some of the kids with cold lunches actually eat better quality food. If so many children are eating 2 meals at school most days, I think it would be essential to teach them about healthy foods, how to use utencils properly, what a placesetting looks like, ect. I too like many parents want to see healthy foods in the lunch room, also I like to see a longer lunch period. They are given about 20 min for lunch and by the time they get through a lunch line. They only have about 10-15 min. to eat lunch. It takes least 20min. for body to know that it is full. So our children are rush to eat, they need a longer lunch period. I still don't fully get the "no knife thing". I know some people may think it could be used as a weapon, but so can many items like pens, keys, and the forks themselves. I can't see why students should be denied a butter knife to eat their lunch with. Which is a partial explanation of why I see so many children and young people with the table manners that a ditchdigger would be ashamed of. My generation ate with knives and forks at school and no one ever stabbed anyone else and my father's generation carried penknives and pocketknives to school and no one considered those a weapon. i'm a student and i must say, i kind of agree with the no metal butter knife rule. At my school, there's like a stand where we get what we need, and there are plastic spoons, forks and knives. There are some pretty crazy things that happen today and schools are just trying to not get sued. For example, we had a kid stab another kid with a pencil this year. I don't understand why knives are automatically out for the "obvious" reasons. I mean, I suppose I can see the fact that it is possible for children to use them as a weapon, but I'm under the impression that these days, it would probably benefit more kids if we would all take the time to teach some simple table manners and to act properly in society. We should be setting an example by helping to show kids how to sit at a table and use a knife as a utensil instead of using it as a weapon. At my school, they have plastic trays, cups, and flatware most days. When students throw their trash away, a lunch lady is there watching. If she sees anybody drop an fork or spoon in the trash, she makes them dig it out before they can leave. Bottom line….it's about doing the right thing for our planet. Enough with all of this needless waste! My school uses reusable trays, but they use the pre-packaged straw, spoon, fork, and napkin. So, if you only need a straw, you have to take the whole package, and then it just all gets dumped! Does anybody know of a grant, or have any solutions as to what we can do to help our schools get rid of plastic ware all together?